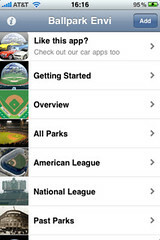 Ballpark Envi is an iPhone app that could be a reasonably useful tool in the arsenal of a ballpark roadtripper. It contains a library of photographs from every active MLB park, and as well as seating charts for each one. From that description alone, and from the 99 cent now $1.99 price*, it’s almost a no-brainer. However, there are two small caveats with this app that I believe are important to keep in mind. #1: Seating charts: Ballpark Envi features seating charts for every active MLB ballpark (and some that are no longer active). This was incredibly exciting to me, and the primary reason I purchased the app. As much as I always try to be prepared and print out a seating chart to bring with me on the road, sometimes things are spontaneous, and other times I am just plain human and leave it in the car or the hotel room. However, this idea is better in theory than in actual practice. Ballpark seating charts are already a challenge to use (which is why sites like SeatData exist, and do well), but when you shrink them down to fit onto an iPhone screen, they are rendered almost useless. With several of the seating charts (like Minute Maid or The Ballpark In Arlington) the section numbers become too blurred to read, even when you zoom in. With Kauffman Stadium, they just skipped the section numbers altogether. I don’t know if there was a way to do this and maintain resolution, but I would have paid more money to have received useful seating charts in this app. 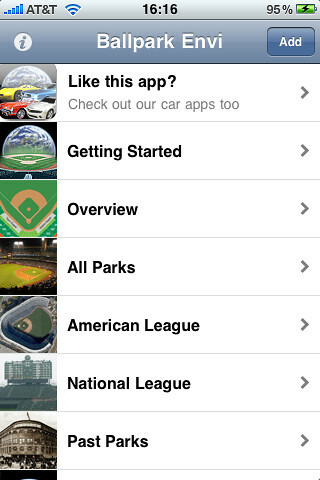 #2: “Transitions”: By now, you’re used to how to navigate around your iPhone. The standard of course is to allow you to swipe the screen to page through apps with multiple screens. Not Ballpark Envi. They are very, very proud of their “transitions” in their slideshows, which will drive you insane after about 5 seconds. I don’t view the collection of seating charts as some kind of exhibit that anyone would want to sit and view. It’s a tool – you want to page through them to get to the one you need. You can’t do that. There is a pause between every single image due to the transitions feature. The same thing is true for each collection of ballpark photos. It is incredibly useful to have a curated collection of useful photographs of every MLB ballpark. I do not, however, want to sit with my phone in the palm of my hand and wait for the images to flip or curl or turn. I want to page through them in the pace that makes sense to me, not have to wait for the app to transition between them using Envi’s fancypants visual effects. (They even offer an option to use the Ken Burns transition between images, which just seems like overkill on a tiny iPhone screen.) A user’s reasonable expectation would be that it would be possible to page through the photographs or images the same way they would in the iPhone’s Photo album. Oh – did I mention this thing was 99 cents? That’s right, I did. For 99 cents, it’s worth putting up with the app’s idiosyncrasies to have this at your fingertips. When I wrote this, the app was 99 cents. For 99 cents, I’ll take a chance on most apps, but more than that, I will waver. I don’t know why the psychological barrier of ONE MORE DOLLAR makes me want to say now I’m not sure this is worth it, but I do believe that this price now makes it borderline given the drawbacks. Maybe I’m just crazy. Caveat Emptor. *Please don’t leave comments about how you don’t pay for software or you don’t use apps you have to pay for. I’ve been working in software development for too long and as a result actively dislike this line of thinking. I buy apps, I donate for shareware or donationware, and I believe you should too, because their production wasn’t free. BOOK REVIEW: MAPLE STREET PRESS METS ANNUAL 2010.